2015 celebrates our 40th year in business! We are so thankful for all our loyal customers and travelers that has helped make this happen. Our company has truly been blessed to help so many people like yourself see and experience this beautiful world God created. We know that you don’t get to 40 years in business w/o doing the right thing for your customers. Everyday we take pride in our mission to give you the most quality tour at the best possible price. Our slogan, “more for less” will continue to be our goal as we help you make your travel dreams come true, without breaking the bank. Motorcoach tours and group travel has never been more popular. Click the link to read the 5 reasons why you should take a group tour! If you are on the fence, it will truly help you realize the benefits of going with a group! We also love seniors and most all bus tours have a senior discount coupon! Thanks again to you, our loyal traveler, for making 40 years in business a reality! Can’t wait for the next 40! 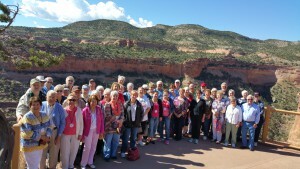 This entry was posted in Announcements and tagged bus tours, bus tours for seniors, group tours, motorcoach tours on May 29, 2015 by Moostash Joe Tours. Now is the time to book your Autumn Fall Foliage Bus Tour with Moostash Joe Tours! There are 3 dates to choose from: Sept 21-Oct 2, Sept 23-Oct 4, and Sept 25-Oct 6. Right now the first two dates still have openings, and the last date is taking a wait list. On all 3 tours you will see magnificent color as you travel through the New England States. You will also visit Chicago, New York City, and Boston. You will not find a better all around tour for the money then our Autumn in New England Tours. I invite you to click on the link below to learn more. You can e-mail at mail@mjtours.com to receive a tour information sheet which includes a day by day description and the hotel list. Don’t delay, there has never been a better time to book you Autumn In New England Tour with Moostash Joe Tours! I promise, you won’t be disappointed! This entry was posted in Announcements and tagged bus tours from Nebraska, bus tours to the new england states, Fall Foliage Bus Tours, motorcoach tours, new england tours on May 20, 2015 by Moostash Joe Tours. Moostash Joe Tours Cruises for 2016! We are very excited to announce our International and Domestic Cruises for the first part of 2016! First, our Hawaiian Islands Cruise back and set for February 11-21, 2016. Make sure to make your reservations now as this tour has limited availability and sells out quickly. Reservations made before October 1 will receive a $150 Per Person Credit! All our tour prices for cruises include airfare from Omaha. We can also work with you if you need to fly out of another Airport. New for 2016 we are also bringing back the very popular Panama Canal Cruise, March 5-16, 2016. This tour includes an everglades tour in Fort Lauderdale, Florida before starting your cruise! Don’t miss this opportunity this year as the Panama Canal is always a popular Cruise. Also for this tour we are offering a special $150 per person credit if you book before September 25, 2015. Click on the tour pages to find the reservation brochure with sign up details. Also, New and Exclusively through Moostash Joe Tours for 2016, we are offering The Legendary Blue Danube River Cruise, May 26 – June 5, 2016. Includes Airfare from Omaha! Experience the Danube River aboard the MS Amadeus Silver II, a brand new river ship, on a seven-night cruise through four countries. Includes two nights in Prague and escorted shore excursions in five cities with English-speaking guides. Visit Czech Republic, Germany, Austria, Slovakia, Hungary, and enjoy 2 nights in Prague! This is a once in a lifetime tour. Don’t miss your chance and book soon! Cabins are limited, and there is also a video included on our tour page to get you familiar with the tour. Thanks again for reading, and we hope to see you on one of our great cruise options for 2016! This entry was posted in Announcements and tagged escorted tour, moostash joe cruises, tour packages on May 12, 2015 by Moostash Joe Tours. Enjoy this summary from our California and Great Parks Tour 2015! Traveling is such an adventure and journey! What great memories and experiences to take with us for a lifetime! Our trip began with delays and detours – it’s only appropriate that we finish our journey with delays. Thirteen days, 12 nights, and 11 different hotels. Those detours and delays made our trip unique and one of a kind. We experienced the extremes of nature – haze from Siberia, a fire requiring Hazmat teams, and the drought in California. On the positive side, we missed twisters, hurricanes, earthquakes, extreme winds, hail, flash floods, smog and driving through snow. We’ve had the best weather ever! The drizzle and rain happened only while we were driving and the snow didn’t stick. When we stopped for breaks, so did the rain. We also missed the experience of seeing chains put on a motorcoach. We saw Donner Pass and left before they experienced their foot of snow. We’ve survived 2 time zone changes – and will complete the reversal tomorrow. It’s tougher going east. We’ve witnessed Paul’s special ability to u-turn a 45-foot bus on a dime and experienced hair-raising mountain drives without guardrails. With Paul at the helm, we’ve survived traffic challenges of Los Angeles, San Francisco, Las Vegas, Denver and Vail. We’ve traveled on shuttles in Yosemite, Muir Woods, Zion and trolleys in San Francisco. We missed the mountain climbers of Yosemite because of weather conditions, but found them in Zion. We experienced motorcycles driving on the line in Los Angeles – folks with a death wish! Luggage may have been late, but it was never lost. We’ve also lost red hats and white hats, billfolds, Kindles, water bottles, ear rings, phones, coats, pocket knives, leather glass cases, pill boxes, and people – some of which have been found and some not. We lost a couple to sickness early on. A few have experienced flu like symptoms. We’ve had some falls. But our group is strong. Our women can take over a men’s bathroom when necessary. They can find the best bargains in Solvang. Our men can survive elevators that fight back. – Hollywood, the Crystal Cathedral, even though it’s still under construction. And the food! Hasn’t Joey picked the best places! You have no excuse if you are still hungry. And most of the places where we stayed have been exceptional. We’ve been to the mountain summits and the deserts; to the wine country and the strawberry country; to Carmel, tinsel town and Solvang. We’ve seen more animals than folks see at Denali – antelope, deer, birds, mountain goats, buffalo, elk zebras, llamas, ostriches, long horns, egrets, squirrels, sea lions, penguins, turkeys, eagles, ducks, geese, frogs, quail, mountain sheep, and rocks with tails – some stuffed, most alive. We missed Bigfoot, jackalopes and Tahoe Tesse. We’ve seen unique trees – jacaranda, sequoia, sugar pine, ponderosa pine. We’ve watched classic cars pass by while we stood in a 3-hour parking lot called California traffic. We’ve seen $3.99 gas, multi-million dollar mansions, billion dollar bridges, and quizzes with wrong answers. It’s the special people on this trip that have added so much to our enjoyment. But the time has come. Be it ever so humble, there’s no place like home. It will be so nice to sleep in our own beds tomorrow. 500,000 sandhill cranes cannot be wrong – there is no place like Nebraska. . . .or Iowa, or Missouri, or Colorado, or Germany. This entry was posted in Announcements and tagged bus tours from Nebraska, motorcoach tours, tours to California on May 7, 2015 by Moostash Joe Tours.